In this website, a couple of articles were recently published in order to debunk the alleged de-industrialization during the period of the federation and the complete union with Ethiopia through the alleged acts of factory removals to the hinterland, discouraging direct foreign investment and complete neglect. This de-industrialization narrative was meant to leave the reader with the impression that the relatively high growth of industrialization was only during the time of Eritrea’s existence under Italy and particularly under the Fascist government. While many have chosen to keep silent, a few have however made a counter argument. They dismissed the claims about economic growth and industrial progress in Eritrea during Haile Selassie era as Asmera-centric and highland-based without making any serious effort to debate the subject. Is their critique fair? Were the lowlands in Eritrea completely a backwater with little or no connection to the economic advance witnessed in Asmera? Certainly not! There is a parallel to the responses made by some of our cyber writers in the literature of Eritrean nationalism, among which is the destruction of the railroads in Eritrea which in the past used to shuttle from Massawa to Biscia near Agordet in the western lowlands. Without exception, all writers including the foreign ones blame the Ethiopian regimes for destroying the railway system, and particularly the Derg regime. The typical example is Michela Wrong. Having researched and dedicated an entire chapter to the railways in Eritrea (Steel Snake) in her book, she failed to discover the authors of the railway debacle; leaving her readers to be only entertained with the “innocuous” episode about the locomotive minus its operators careening through many stations, allegedly by the ELF fighters. The few who find this too unpalatable blame the vagaries of war, forcing the combatants to use the rails to build the trenches. In many instances, the alleged perpetrators are supposed to be solely the Ethiopian soldiers. The irony is that, in their journey to fight for independence, Eritrean nationalists have used economic warfare1 to weaken the much numerous and strongly equipped Ethiopian empire and to gain propaganda in the world. They were not shy to own plane hijackings and bombings, sabotage of industrial assets, and certainly the ambushes and de-railings of many steam locomotives and litorrinas (light rails) that had no military purpose. Pictures of the incidents were either made available for major newspaper reporters or the journalists were sneaked in to the place of sabotage. The first major attack happened in December 1970 at Asciadira, a station located a few kilometers northwest of Keren. 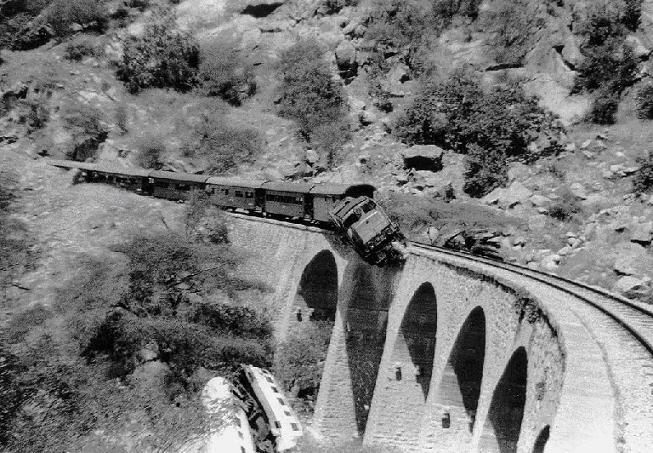 Having removed the rails, the ELF fighters removed the passengers from the trains and littorinas, subsequently plunging them into the ravine under the viaduct bridge. Rail transport was not the mode of transport for the Ethiopian army, the Eritrean police or the commando (commandis in Tigrinya) as in the adventure of Lawrence of Arabia, in which Arab nationalists fought and destroyed Ottoman trains and soldiers travelling in the strategic Hejaz Railway. To the contrary, the Ethiopian army and other units mainly depended on motor transport and avoided the slow trains and steep valleys lethal for ambush battles excepting the few policemen on official duty or vacation. In light of this fact, the policy of targeting the trains and littorinas was not legitimate. This is a stark example of the insurgents’ practice of economic warfare, but not limited to it. In a rare case of admission, a former EPLF fighter, Johannes Beraki, stated, “We used to try and try to shell the brewery [the Melotti Brewery] from the hills,” …”We managed to hit everything around it, but never the brewery itself.”2 In her research for the Financial Times, Michela Wrong indicated that, “Attempts were made to mine the five-unit complex, but the presence of 200 Ethiopian troops posted around as protection had its effect. It was only when the guerrillas seized the port of Massawa, cutting off supplies of essential raw materials, that the brewery was forced to close.” They were however to lay siege and shell another important site in the country side. Elabered, located on the road to Keren, lies in a bowl-like terrain surrounded by huge mountains. It was like an oasis for the weary traveler who, having experienced the relentless heat and arid landscape before it, finds relief. It was a modern commercial farm growing fruits, vegetables, and dairy products. And most importantly, “It was the most complete agricultural set up in Ethiopia” The mountains that sheltered the orchards from sudden frost and cold winds switched their purpose when Eritrean combatants dug their trenches on it and laid siege to the farming town around 1977-78. In the same manner, the grudging acceptance of industrial growth and commerce in Asmera, while ignoring the important roles of the major farms such as the Barattollo cotton plantation, the Elabered agro-industry and the relatively new modern farm in Ghinda is, to say the least, dishonest. Without the major input of the raw materials, most of the light scale factories in Asmera, which made them self-sufficient, would not have been able to remain competitive in the regional market. Without the important role of the railroads, the legumes, skins and hides exported in bulk to the outside world would not have been equally viable. More particularly, the pastoralists and farmers depended on the trains, which were much cheaper than the buses, for both transport and moving their little merchandise to the city of Asmera. “At its peak in 1965, the railway carried 446, 000 passengers and 200,000 tons of freight a year”4 reported New York Times, an almost impossible achievement out of a population estimated to have been less than 3,000,000. The trains shuttling along the east-west corridor of Eritrea hauled some of the products raised in the modern farms and villages of the lowlands leaving the perishable products for the flexible and speedier trucks. Here is a sample of list of Table of Exports for fruits and vegetables of the few 4 years before the Asmara Expo 69 event. Source: the Executive Committee of Asmara Expo 69; Il Poligrafico P.L.C., Asmara, 44. Source: the Executive Committee of Asmara Expo 69: Il Poligrafico P.L.C., Asmara, 44. The above two tables show the figures for the fruits and vegetables produced in the farms increasing at a bigger percentage except for the dip in 1968; owing to the incomplete data for the rest of the year. The thing is however that most of the major farms were in their initial stages of business, waiting for the opportune moment to maximize their production from the yet unused but prepared of thousands of hectares. The fact that they ventured into the export sector and cornered some markets in a continent which was largely marginalized was very impressive. Unlike the white elephant projects littering the Eritrean landscape, the industries linked and the modern farms linked with them in the lowlands were vibrant and profitable. Clearly, the benefits also trickled to the thousands of workers and of both highland and lowland communities. The De Nadai group made similar investment among the farming communities in the town of Elabered. Neatly built blocks of houses, schools, clinics and tap water were made available still visible now from the asphalt road. The farms were also instrumental in encouraging independent farmers to launch their own farms producing cotton and fruits with the help of the companies, resulting in the spread of modern agricultural and technology among the farming and pastoral community. The Ghinda farm located in the eastern escarpment was modeled after the Elabered estate, but much bigger. The stable livelihood and amenities from it were however brutally interrupted as a result of insurgency, leaving them poor and isolated from the convenience of the railroad transport. 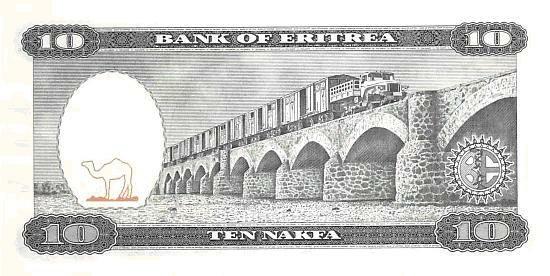 In the 10 Nakfa currency of Eritrea, a cannibalized Soviet Ural truck pulling several wagons is embossed, showing as some would put it the phoenix-like revival of the grandeur and inventiveness of Eritrea. What era is it evoking? The epoch of the war economy in Eritrea under Mussolini? Or the peace-time economy of the federation period and thereafter that lasted close to twenty years of growth? What is the purpose of such an engraving in light of the self-inflicted destruction of the locomotives and railways and the total derailment of the economy in Eritrea; including, yes; the lowland regions of Eritrea? If the Soviet Ural truck is meant as the proverbial turning swords into ploughshare, the war mongering policy of the present regime with several of its neighbors contradicts it. The nationalists’ mantra in Eritrea has been “Starting from scratch”. A slogan devoid of admission about the role of the political actors in the physical aspects of the war and the opportunity lost for industrial revolution. What do we make of the other famous mantra? The train (babur), that is, the revolution, as Eritrean nationalists lovingly call it has in deed achieved its goals of to getting rid of Ethiopia’s rule, but at incalculable cost to the resources of the land and its people. The architects of the revolution (sewra) have been applauded by many for refusing the offer of foreign companies to re-build it in a modern way, and instead mobilized domestic labor to recreate it as it was in the colonial past. In fact, most of the participants were forced laborers. The drivers of this revolution, who have lately become railroad enthusiasts, were the same people who carried economic warfare for decades that sent Eritrea’s material and human resources down the gorges to this present day. True, the insurgents, who sent the two littorinas and Krupp locomotive engine hurtling down the abyss were from the Eritrean Liberation Front (ELF), which dominated the Asciadira area in 1970. That doesn’t mean the Eritrean People’s Liberation Front (EPLF) would have refrained from the same practice. After all, they both embraced economic warfare as a means of war. It took Italian colonial Eritrea about thirty years to build the “steel snake” to serve her as a military instrument; it equally took the thirty years of nationalist insurgency for it to wither away from the landscape (excluding its present caricature), except for the brief period from 1950-70s indicated before. Hence, the need to inspect the truth about the brief peace-time economic period, which comprised the lowland regions of Eritrea, the lowland regions’ forward linkage with the factories in Asmera and the subsequent rapid progress witnessed in industrial growth. Campbell, Franklin John. Rumblings Along the Red Sea: the Eritrean Question; Foreign Affairs; April 1970 Issue. Wrong, Michela. Survey of Eritrea (30: Operating at full bottle/ Profile of Asmara Brewery; Financial Times (FT)-Thursday, January 18, 1996. Lebona, Zekre. Asmara Expo 69: The Lost Age of Industrialization in Ertirea; Asmarino.com; April 4, 2014. Mckinley Jr., James C. Working on the Railroad, and on Eritrea’s Revival; The New York Times; May 19, 1996. Dolce Vita; the Italian Life Style; website.